“Forest Therapy®” is a research-based practice supporting the healing of individuals through the immersion in forests.The name taken from the Japanese art of “Shin-rin-yoku”which translates to “Forest Bathing”. From the moment you set foot in a lush forest covered with dense vegetation and fragrant fresh soil, you can feel life surrounding you using all your senses. We experience the therapeutic and relaxing power of the forest. The act of immersing yourself in a forest to enjoy this effect is called “Forest Bathing”. While it has always been intuitively known, there is little discussion about the physiological mechanisms behind these healing effects. Diseases due to lifestyle choices as well as mental disorder have recently become a major problem in society. 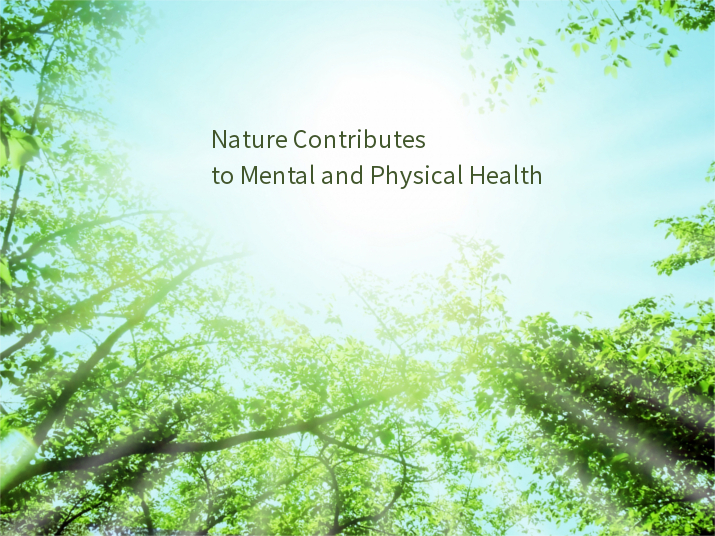 With the growing interest in physical and mental health, people have started to actively seek fact-based scientific information on the health benefits and stress relieving aspects of “Forest Bathing” rather than relying on simple empirical-based evidence. Consequently, scientific studies on the physiological impact of “Forest Bathing” have been undertaken and a protocol for “Forest Therapy” was developed as well as looking into the possibility of further clinical applications. “Forest Therapy”is a research-based healing practice through immersion in forests with the aim of promoting mental and physical health and improving disease prevention while at the same time being able to enjoy and appreciate the forest. To give you some ideas for activities one can enjoy while practicing “Forest Bathing”, there are relaxation techniques such as mindful meditation or yogic breathing in the forest, as well as aromatherapy. Also, physical fitness programs involving forest walking and Nordic walking. There are also quaint towns and villages nestled in these forests where that we can enjoy hot springs and healthy local meals prepared using fresh local ingredients. Some places also provide health consultation in cooperation with a physician. A “Forest Therapy Base” and a “Therapy Road” are scientifically approved locations with forests and urban environments where experiments were conducted analyzing the healing and preventive medical benefits due to the environment. The certification program to register a “Forest Therapy Base” stared in 2006 and so far 62 sites have been registered across Japan. Some might feel a certain amount of apprehension when walking in an unfamiliar environment and being in a forest. They might be concerned about a path’s steepness or that it is too tiring; however, certified “Forest Therapy Bases” are bright and most “Therapy Roads” possess gentle slopes. “Therapy Roads” are also completely barrier -free environments and are fully wheelchair accessible. To guide visitors through forests are “Forest Therapy Guides” and “Forest Therapists”. A “Forest Therapy Guide” and “Forest Therapist” is a trained professional who can assist and provide advice on mental and physical health for disease prevention through being out in the woods. “Forest Therapy” is neither hiking nor mountain climbing. Why don't you come and experience for yourself the beneficial effects of forests? “Forest Therapy”encompasses all the general recreational activities which take place in the forest. Through activities such as relaxation and improvement of the immune function ,we except preventive medical effect. It is proposed that we plan and conduct “Forest Therapy”carefully based on the evidence. In the future, “Forest Therapy”may assist various therapies in the medical field. However, “Forest Therapy” should be practiced under the instruction of a physician until the evidence becomes admissible. Sources: Forestry and Forest Products Research Institute (Germany), Center for Environment Health and Field Sciences Chiba University, The Medical Association of Nippon Medical School, The society of Forest Medicine within the Japanese society for Hygiene. Physiology, psychology and physical experiments executed in urban and forest environments indicate that the average concentration of “Stress Hormones“ called salivary cortisol, in participants exposed to forest environments was lower than that of participants of the urban environment control group. In addition, measurements of the heart rate “Yuragi“ showed lower sympathetic nervous activity which is a consequence of reduced stress, and an increase in parasympathetic nervous activity which is a result of slowed activity of the prefrontal cortex. The experiments also indicated that a three-day/two-night forest bathing trip boosted the immune system demonstrated by an increase in the body's Natural Killer (NK) cell’s count. Measurements of the environmental temperature, humidity, radiant heat, wind speed, layers of clothing　and active mass. When comparing the PVM of the urban environment with that of the forest, the forest environment had a higher comfort zone than the urban environment. This indicated that being in a forest is more comfortable, influenced by temperature, humidity, wind and radiant heat. Measure of chemical substances (phytoncide) such as Alpha-Pinene that plants release. Regarding chemical substances of phytoncide which trees emit, Isoprene was the most commonly detected in “Forest Therapy Roads” and also Alpha-Pinene, Camphene and Beta-Pinene were detected. Using the POMS questionnaire to measure a person’s mood (tension and anxiety, vigor) etc. The urban and forest environment comparison experiment indicated that the level of “tension”and “fatigue” decreased and “vigour” increased in participants after session of “Forest Bathing”. The cortisol is representative as a stress hormone, and concentrations increase in stressful situations. Concentrations levels are measured from a person’s saliva. The figure on the right shows the level of cortisol stress hormone concentration. The salivary cortisol level from participants taken in a forest environment was noticeably lower when compared to the level of participants taken in an urban environment. When in a stressful situation, the systolic blood pressure, diastolic blood pressure and pulse rate all increased. The figure on the right shows the level of systolic blood pressure and pulse rate. Through”Forest Bathing”, it indicates that the systolic blood pressure and pulse rates decease in participants when taken from forest environments compared to the vitals taken from participants in urban environment. In order to analyze the heart rate, we separate autonomic nerve activity into sympathetic nerve activity (increases when stressed) and parasympathetic nerve activity (increases when relaxed). The figure on the right shows the sympathetic activation, an index of the stress. Through “Forest Bathing”, the graph indicated that sympathetic nerve activity, in forest environment participants, was suppressed when compared to the levels measured in participants taken in urban environments. The figure on the right shows the variation in the concentration of a person’s main anticancer protein count before and after a 2-day “Forest Bathing” session. The study indicated that “Forest Bathing“ produced an increase in three kinds of main anticancer proteins, Granulysin, Perforin and Granzyme. This indicated that an increase in anticancer protein brought on by “Forest Bathing” and resistance to cancer increases. The figure on the right shows the change oｆ NK activity before and after a 2-day “Forest Bathing” session. The study showed that by “Forest Bathing“ increases NK activity by 27％ in 1 day and 53％ in 2 days. NK activity was increased by “Forest Bathing” and a person’s resistance to cancer also increased. Forestry and Forest Products Research Institute (Germany), Center for Environment Health and Field Sciences Chiba University, The Medical Association of Nippon Medical School The society of Forest Medicine. ※Above figures are experiment results conducted at “Forest Therapy Base” at IIyama, Nagano. For more information, please visit the The society of Forest Medicine within the Japanese society for Hygiene . Home　｜　Sitemap　｜　Contact　Copyright forest therapy society, All Rights Reserved.